Altar dedicated to the god Ehécatl, located in the middle of Metro Pino Suárez, in the Cuauhtémoc borough of Mexico City, on the southern part of the city centre. This altar was unearthed during construction of the station in 1967 where it remains to this day surrounded by the passageway between Lines 1 and 2. Back in the sixties the government, in preparation for the upcoming Olympic games of 1968 decided to start building the subway in Mexico City. While excavating they unearthed a round shaped altar built by the mexica around the 1400’s. It’s discovery presented a problem , the National Institute of Archeology and History ( INAH), intervened and after serious discussions metro officials signed an agreement to let the altar remain and allow INAH officials to preserve and maintain it. So passageways were built around it, local fauna planted to spruce it up , river rocks and illumination were implemented. The station is named after José María Pino Suárez, Vice President of Mexico during the term of Francisco I. Madero (1911–1913). However, the station logo depicts a pyramid dedicated to Ehecatl, the Aztec god of wind. This pyramid was discovered in the early construction of the station and it can be seen on display along the main transfer corridor. The station was opened on 5 September 1969. The Ehecatl pyramid, the smallest archaeological zone in Mexico. It is one of the most visited archaeological sites in the country, although the National Institute of Anthropology and History (INAH) does not consider it a proper archaeological zone, due to its size and the fact of being located in a Metro Transport System facility. 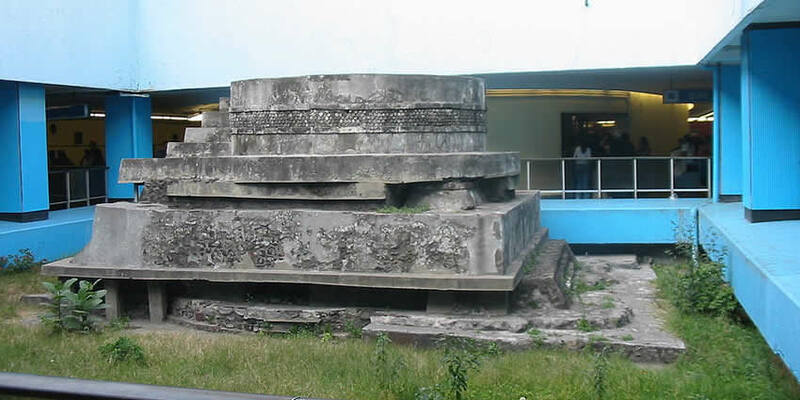 The Ehecatl pyramid in Pino Suarez is thought to have be part of a larger ceremonial centre, complete with a corridor from the shrine to Iztapalapa. Most structures were affected during the Metro construction, but this monument could be rescued due to its location and conservation state. A few offerings have been found inside the pyramid, for instance ‘La Monita’, a carved sculpture of a monkey carrying the mask of Ehécatl and two snakes. The figure known as “La Monita” is a rare carved figure, painted in red and black, that carries the Ehecatl mouth mask; 2 serpents are part of the sculpture, one coiled at the base and other that becomes the tail. The INAH Archaeological Studies Direction keeps the files regarding the excavation and rescue that began in 1967, headed by the Catalonian archaeologist Jordi Gussinyer, the historiography of every element found and its exact location during the Metro construction. One of the temple characteristics is that it has 4 structural construction stages, as Templo Mayor, and it counts on a circular base that functioned as a pedestal for the deity placed at the top.